23 Extra! Extra! Organizing Reads! First, let's do a little happy dance to welcome the weekend! Anyone have anything fun and exciting planned? Traveling? Some organizing? A project? Maybe some guest entertaining? I love this time of the year when things start to slow down a little and we have more flexibility in our weekends, so we will be entertaining and projecting. Football Sundays are always good too! We are going to put some energy into our storage room and will also be tackling our paint storage problem (since we removed it from our storage room earlier this year). So fingers crossed we make some progress and I have a few fun new things to share next week. Today, I am popping in to give you some extra organizing reads to check out around the blogosphere. 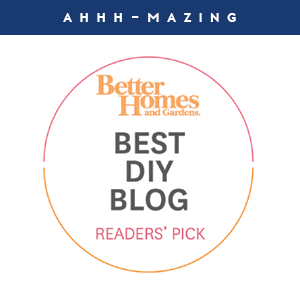 As many of you know, not only do I write at this place I call home, I also contribute over at Better Homes and Garden's Style Spotter's Blog and occasionally work with other websites and blogs as well. My most recent articles on the Style Spotter's Blog have been inspired by our climate changes and the upcoming holidays. Our air is getting crisp, the ground is frosting over, candles are being lit, delicious treats are being baked (by our local grocery store) and the bin of winter gear has been pulled out of the garage. Autumn is officially here! 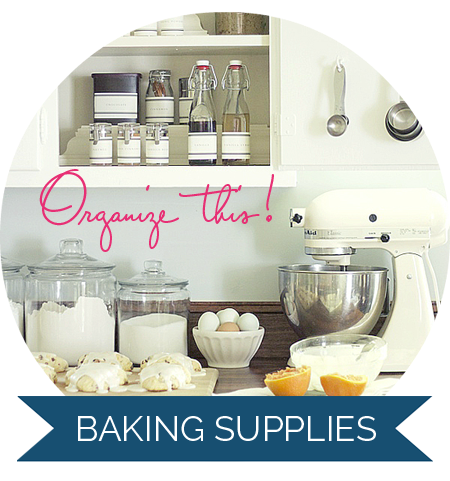 For those that love to bake, how do you best store all of your baking supplies? In this article, I touched on everything from mixers to sprinkles and even those awkwardly shaped baking pans. Not only is it baking season, it is entertaining season! With the holidays quickly approaching, do you have a favorite way to store all of your cherished serving pieces and linens? 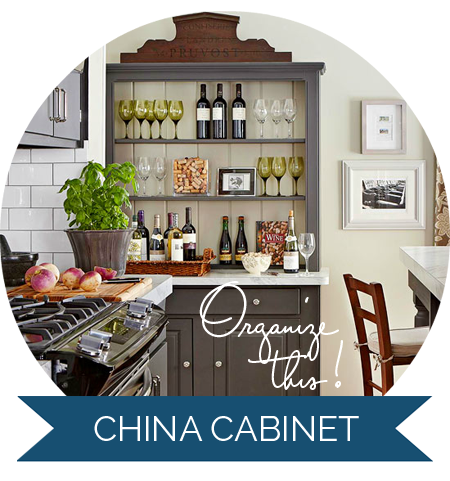 I personally love a good china cabinet! 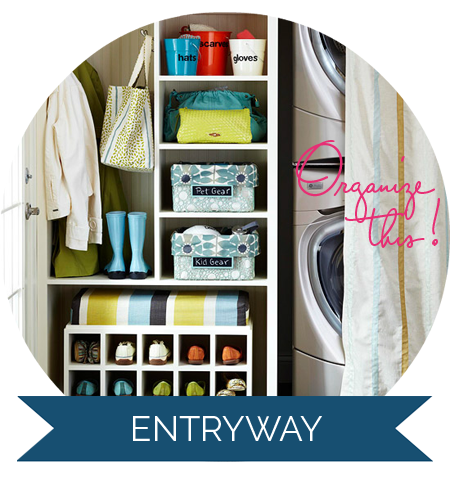 And now that winter gear is officially out of the bin and coats are on hangers in our closet, I thought I would share my favorite entryway alcove and why I think it works so well! Last month I shared my excitement when I found out I was featured by my gal pal Oprah. Oh wait? She still doesn't know who I am? A girl can pretend right? Anyway... her peeps featured me again! Twice in two months is totally making me blush! This round-up includes quick and easy yet super inspiring tips for making updates to your bathroom. 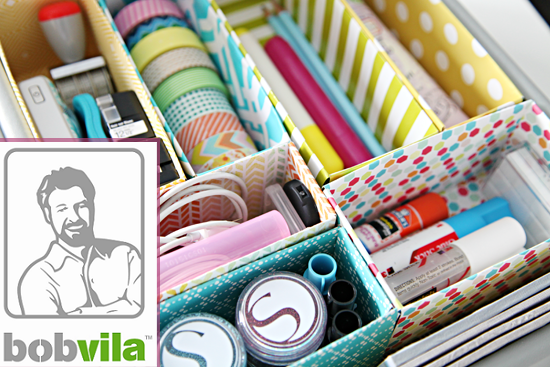 Our cereal box dividers have officially been Bob Vila approved! 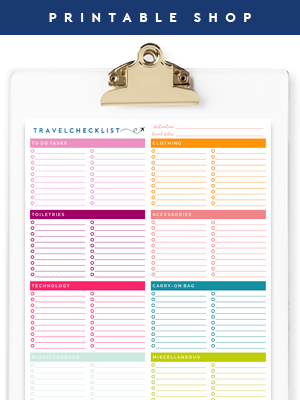 They were also featured on his website which is sharing amazing organizational solutions for dorm dwellers. 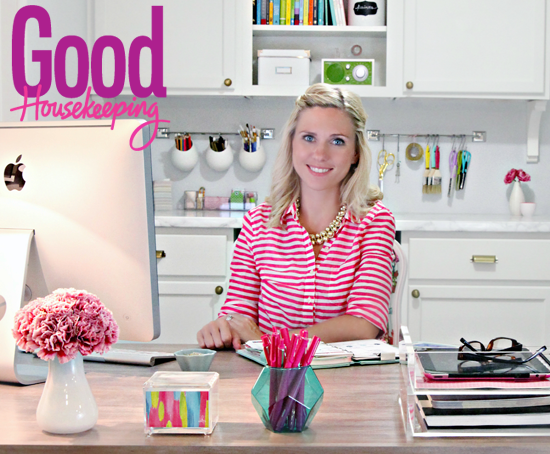 Earlier this week I had the privilege of being interviewed by the folks over at Good Housekeeping! Their name is one I have admired since my childhood years and the opportunity to collaborate with them on an article is a really big milestone moment for myself, and one that I can't wait to share with their biggest fan, my grandmother. Although I love to organize, I would never proclaim to be the most organized woman on the internet (yet so honored they would title the article as though I am). 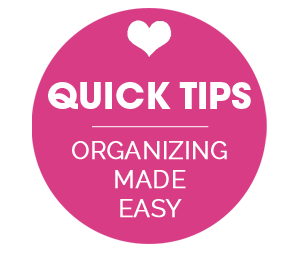 However, I did share ten super simple tips for starting an organizing project and chatted about a few lessons learned along the way. It was an honor to celebrate my five year blogging milestone in September and I just wanted to thank you all for your kind comments, emails and notes on social media, congratulating and encouraging me along the way. Blogging is never something I take for granted and I hope that I still have a few more years ahead of me. At the end of the day, you pals keep me motivated to continually tackle spaces and share it here, so consider this as me hugging you in a very bear-like way. Cheers to five more years of organizing fun and to the weekend! And who is ready for the next organizing link party? I will have that to you soon! Yours is truly my favorite blog! Thanks for all your hard work to make this blog so special! Speaking of blogs, I know you have mentioned Young House Love in the past. 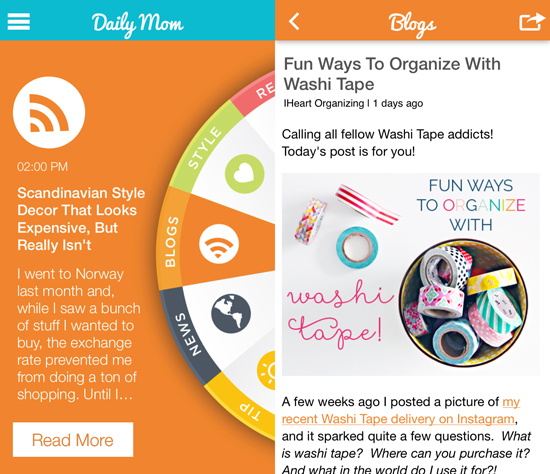 How do you feel about their decision to take an extended hiatus from blogging? I would be sooo sad if you decided to do the same! So glad you are being duly rewarded for following your passion. It always works out that way. Enjoy! Hello, from Malaysia! Congrats on your 5th bloggerversary! 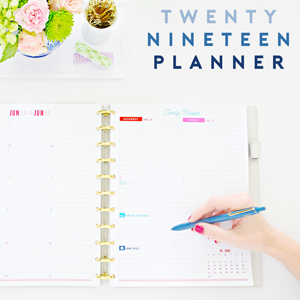 I recently got into planning and organizing and have been loving your blog. You have so many fabulous tips and I really appreciate them. Great pic on good housekeeping...your grandma will love it! Thanks for all the links:) It's going to be rainy here in St. Louis tomorrow--we're planning on starting a basement clean-up...right now it looks like "that 70's show!" Hi jen just wanted to say Happy Thanksgiving from Canada. Its our thanksgiving weekend up here. Love the blog! Hey Jen! I've just found out about your blog and I'm completely in love with it! I'll probably come back every day! I'm at a huge organization-plans moment of my life, since my dad is one big hoarder and my mom just buys way more stuff than she needs and NEVER puts stuff back where they belong! The problem is, we are living with them and my twin girls are gonna start walking soon! I have a LOT of work in my hands! So, I'll definitely need your blog! Congratulations on the articles and lifestyle! it's amazing! Cheering you on from here and best of luck to you and your family. 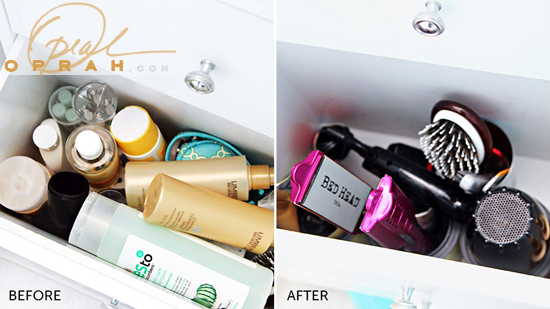 :) Organizing is a process, that is for sure. One day at a time Shell, you've got this! Your principle of "don't make a system too complicated" has truly revolutionized my approach to organizing. I'm finding the balance between "perfect" (which I want) and "functional" (which I need). What has made the most impact for me is having less stuff. After donating countless bags of whoknowswhat this year, my home feels much more clean and open. Thank you for continuing to teach and inspire! That is so great to hear! Less is more, that is for sure! Hi Jen! So this is going to sound really odd--but I was checking out your awesome pic from Good Housekeeping and wanted to mention it to you because it was something that my chiropractor mentioned to my husband. You may find that having your computer at an angle might start making your neck sore if it hasn't already. The hubs and I are Ph.D. students and we spend probably as much computer time as you do--and it's totally an occupational hazard! Cheers to good computer-use health! Congratulations on ALL of the publications!!!! You're rockin' it girl! So many fun things happening for you girl! Congrats! I really want to tackle some things in the kitchen...what though? I'm not sure, but I'll get there! Hope you guys are having a great weekend so far! I absolutely love your blog! My husband and I were recently trying to decide on a camera purchase after our last one got lost and I saw your post about your DSLR purchase. Unfortunately when we decided to research DSLR options we could not come up with reasonable price ranges. Could you please suggest one that would be budget friendly (200-250$)? Hubbys birthday is approaching and I was really hoping to surprise him with a DSLR. I would really appreciate any guidance you can provide! Thanks so much! Happy birthday to your hubby! DSLR's can get pricey, I started with a Canon Rebel and really loved it as a starter DSLR (I am a Canon girl). I would keep an eye on discount electronic websites or look to purchase one refurbished to stay within your budget, as a typical body and lens will start around $400-$500 for the kit. I know that some of our local camera shops offer refurbished/used options for both bodies and lenses, you can also look into renting one until you decide what you personally love. Best of luck! xoxo! Love that entryway! 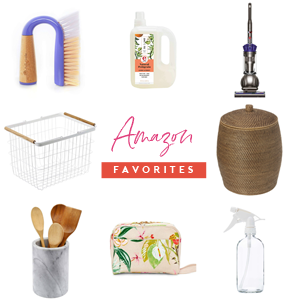 Also very much in need of some bathroom organizing and storage ideas so I'm looking forward to checking that link out.